This week has been a very productive week with great visible chunks of progress made on projects. The first Forest Moon of Endor sock is complete with the second about to be cast on. Streusel, which is now on the decreases and hopefully I will make good progress with those over the course of today. Last week I did complete all the increases but I did have 66 g of yarn left and I wanted to use all of this skein in the shawl so instead of increasing further I continued on without any further increases until I had 42g of yarn left, this should be enough to finish off the decrease section of the shawl with a few g’s to spare…it sounds good in theory doesn’t it but as to whether it shall work out like that, well stay tuned! I’ve made great progress with the new sample knit of a design I’ve been doing this week. The pattern is now ready to be drafted from the notes I’ve been taking and charts made. I’ve a bit of swatching to do this week and a new design is finishing up its test knit and will be coming out this week. I also got one further cloth made this week on the school runs. My Ravelry project page for this YOP -Year 5 can be found here. To read other blogs taking part in YOP – Year 5 check out the Ravelry group here. This entry was posted in Celtic Knits, Crochet, Designs, Knitting, Year of projects and tagged Dishcloth, Forest Moon of Endor, New Design, Shawl, Socks., Streusel, Swatching. Bookmark the permalink. Your sock turned out great. The colorway is pretty, and yet doesn’t swallow up the design. It’s funny how we all love that variegated yarn, but it can be problematic when choosing patterns. Streusel is looking good too – love the delicate edging. That Forest Moon of Endor sock is so striking! I love how that blue shows the pattern so prettily – peaking out from the dark color. It’s a very neat effect. While I have total confidence in you, I wonder (with the Streusel) if you feel as nervous as I do when trying to finish something before the yarn runs out. It is such a sweet looking scarf/shawlette. Now that I’ve clicked through the links for Leonore and Fledermaus my queue’s two patterns longer! I really like both, but if it were me I’d go with Fledermaus – a little more going on there than just twisted stitches. 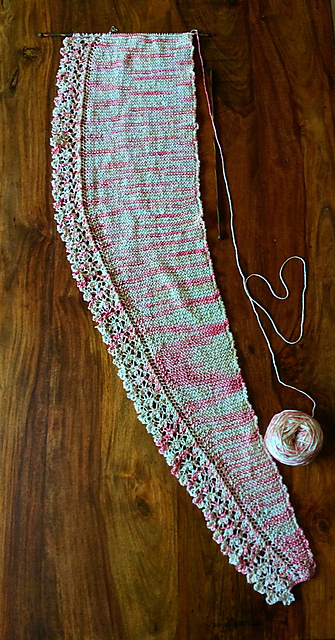 If you do decide on Leonore I’d look for a solid coloured smooth yarn so that the pattern really pops. Busy as always! Love the sock, the long stripes turned out perfectly and streusel is gorgeous. Thank you yes it’s funny how the yarn seemed to just suit the pattern, not completely but the best out of what I had here. The Endor sock is dramatic with the light and dark. It’s like a yin and yang or Jekyll and Hyde of the moon. The shawl is sweet like square mints with raspberry cordial at a garden party. You really do keep quite busy don’t you? Ah yes, it’s a fault of mine. I work best in an ordered kind of chaos type setting. 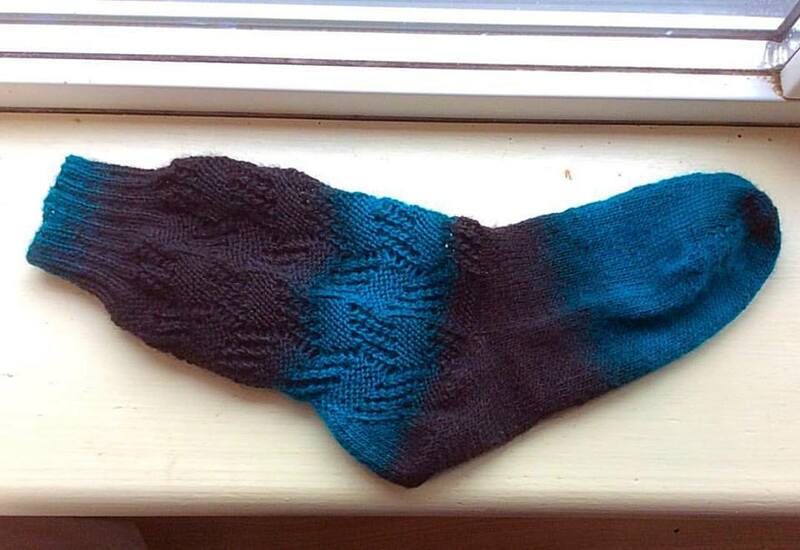 Beautiful, evocative colours on that Endor sock, I really like it. Streusel is looking very pretty!